Buy online 1.89 in. 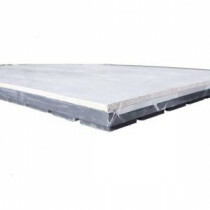 x 2 ft. x 4 ft. Tile Insulated R7 Subfloor Panel AMD0150MG and leave review or share with Your friends. Amdry Insulated Tile Subfloor panels are designed to offer a better, easier, quicker insulation system for any glue down flooring surface application like ceramic, porcelain, stone or marble tile surfaces ( always check with tile manufacturer on best adhesive choice for your specific product ); allowing the contractor/owner to utilize unfinished space with a modular panel that incorporating vapour barrier, insulation, and a water mold and mildew resistant subfloor surface finish; cost effective, quick and easy to install. Use in basement bathrooms, gyms or kitchens; garages or sheds; similarly with commercial, agricultural, retail store, and industrial applications. The Amdry panels are designed to include the highest quality surface materials, laminated to rigid EPS insulation, to provide a simple One Step quick, reliable and long lasting insulation solution. NO additional connectors are required with these panels; simply glue together with PL300 or similar foam approved adhesives.